The grandson of Andrew Geller, the designer of Leisurama homes, wants to know what happened to his grandfather's products in Florida. Geller created the model kitchen "Splitnik" used during one of the most famous television moments of the Cold War - the notorious exchange between Nixon and Khrushchev during the "Kitchen Debate" at the American Exhibition in Moscow in 1959. From "Splitnik," Geller later developed the Leisurama home. 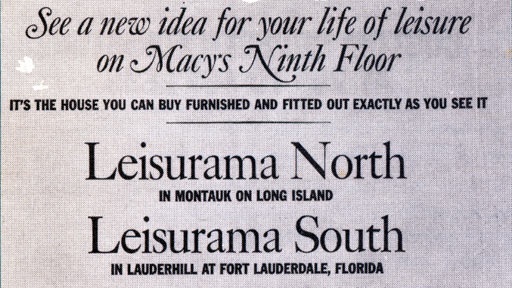 A newspaper advertisement suggests the Leisurama homes were widely sold in Florida, but so far Andrew has been unable to locate them. History Detectives heads to Florida and New York to learn more about this Cold War event, the emergence of second home living and the influence of leisure on architecture. Also in Post War: 1945-1960 Airstream Caravan Was this mobile home part of a modern-day wagon train halfway across the world? Also in Season 3 Lindbergh Engine Could a 24-year-old have single-handedly built the engine for Lindbergh's plane? Also with Gwen Wright Universal Friends What can this 200-year-old document reveal about the first American-born woman to lead a religious movement?